My Grandma Harris did not like to cook. I don’t have many memories of her in the kitchen, except for one, and it doesn’t really involve cooking. Grandma Harris lived simply and didn’t have much, but she loved her grand-kids and shared with us what little she had. One of my favorite memories of her is when she would take my sister Stephanie and me fishing. Before we left the house, she’d rummage through her fridge and pull out white bread, bologna, mayo and mustard. I liked mine with pickles. We made ourselves a few sandwiches, took the fishing gear and headed for Sarasota bay. Despite my grandma’s aversion towards cooking, my Grandpa Harris had a knack for it. he passed away when I was young, so I didn’t get to know him very well, but my mom told me that he always made navy bean and ham hock soup. 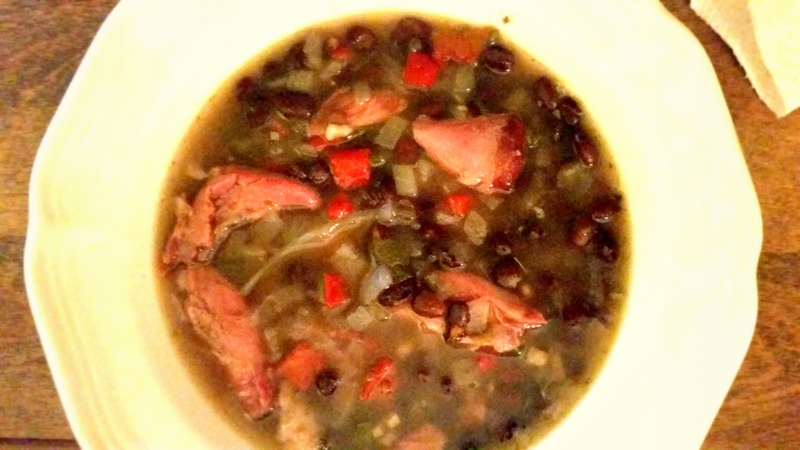 Sure enough, she took after my grandpa, because her all time, hands down, best dish ever, is her black bean and ham hock soup. Takes about 6 hrs in the crock pot. 4 cans of black beans, drained and rinsed. Put all your ingredients in the crock pot. Nestle the ham hocks in the center. Cook on high for the first half, then set the crock pot to its low setting for the second half of cooking. 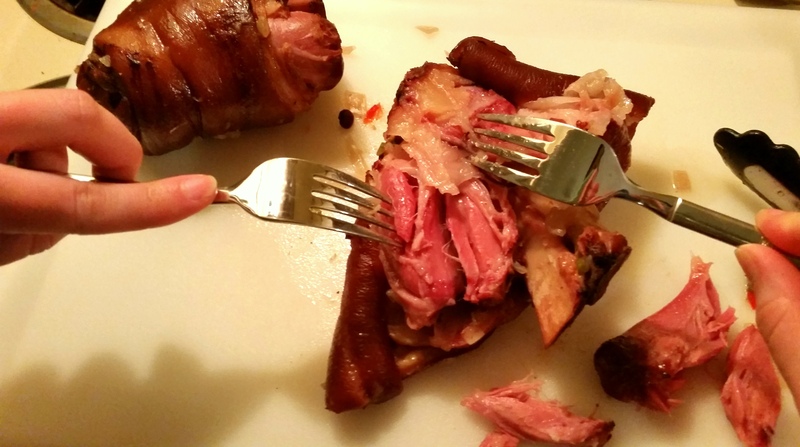 Before serving, remove ham hocks from the soup. Take the meat off the bones and shred it into smaller bite size pieces. Return the meat back to the soup and serve. I like to eat the soup as is, but you can certainly cook some rice to go along with it. Guess what will be on the menu in a week or so… 🙂 great recipe, Sue (thanks, Em)! Great! Let me know when you make it! Grandma and her bologna sandwiches. Thanks for posting this one, it made me smile to remember that. I’m going to try making this soup. Okay, so I did a little research because I wasn’t sure on that one.